Students who are auditory or strong interpersonal learners will have better understanding of the novel if they discuss it with someone else. 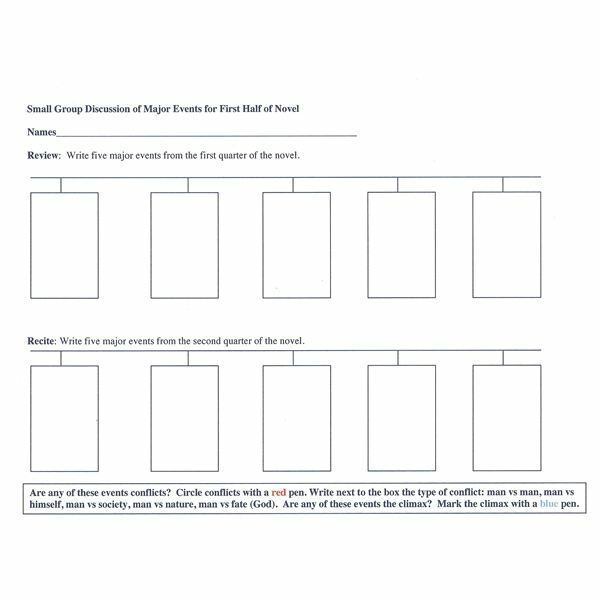 Create small groups to discuss a whole class novel or small group novel. Items needed: Novels for small groups of three-to-five students and the handout for the first half of the novel. Step 1 – After the small groups have been formed, assign students to read the first half of the novel. Step 2 — Give the handout to the students. It should be filled out before the group discussion is to occur. Make sure that students understand conflict and climax. Direct a class discussion on the two topics. Step 3 – Provide class time for the discussion. Students can start by discussing what they wrote on their handouts. They may have different main events, conflicts and climaxes. A great discussion will be one where they offer reasons and defend their choices with examples from the novel. Man vs. man – This is a conflict or a problem between two forces, usually people.It can be a physical or verbal conflict or fight. For example, two boys can be fighting over dating a girl. Man vs. himself — This is a conflict that a character has within him or herself. A character can be trying to make a major life changing decision or trying to decide between right and wrong. For example, a girl needs to decide if she wants to stop being friends with one girl because her other friends don’t like her. Man vs. society — This is a conflict where a character does not conform to society or cultural rules. The character may not dress or act like everyone else and struggles to find his or her niche in society. Or, a character may be different and the members of the community fight against him or her. For example, a character may want to shave off her hair. This may cause students in her school to harass her. Man vs. nature – This is a conflict between the character and “mother nature." The character may face a hurricane, blizzard, freezing night, etc. For example, a young man may get separated from his hiking party and spends the night out in the woods in freezing rain. Man vs. fate – This is a conflict between what is to be and what the character wants his or life to be. Some stories portray fate as God’s will. For example, a character feels that his fate is to become a warrior. He may try to change it by leaving his homeland. The climax is the turning point of the novel.It is usually midway in the novel; however, it can come later or earlier. Teachers should be roaming the room to monitor the discussions. Students should turn in their handout for the teacher to evaluate. On the back, ask students to briefly describe their small group discussion. They should tell how their answers were similar or different to those of their group. Also, ask what they learned from the discussion.